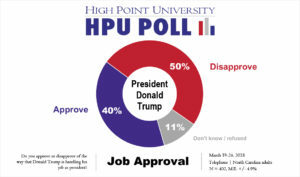 HIGH POINT, N.C., March 28, 2018 – A High Point University Poll finds that North Carolinians give President Donald Trump a job approval rating of 40 percent. Meanwhile, a majority (64 percent) continue to say the country is headed in the wrong direction, and North Carolina residents are split on who they would vote for in U.S. Congressional and North Carolina General Assembly races if they were held today. Half (50 percent) of North Carolina residents say they disapprove of the job Donald Trump is doing as president, and the remaining 11 percent do not offer an opinion. Just over one quarter (28 percent) of respondents say the country is headed in the right direction, which is similar to the 26 percent who said they felt the same way in March 2017. In the current poll, 8 percent of respondents did not offer an opinion either way. When asked about their choices for U.S. Congress, 41 percent of North Carolinians say they would vote for the Democratic Party’s candidate if the election were held today, and 35 percent say they would vote for the Republican Party’s candidate. A relatively substantial 19 percent say they did not know or were unsure for whom they would vote. There were similar responses to these “generic ballot” questions about the elections for houses of the North Carolina General Assembly. Forty percent of these North Carolinians say they prefer the Democratic Party’s candidate in their local race for North Carolina House of Representatives, and 35 percent say they would vote Republican if the election was today with 21 percent undecided. Finally, 40 percent of the same respondents say they would vote Democratic in their local race for North Carolina Senate compared to 37 percent who say they would vote Republican and 19 percent who remain undecided or did not offer an opinion. Do you think things in this country are generally going in the right direction or do you feel things have gotten pretty seriously off on the wrong track? Do you approve or disapprove of the way that Donald Trump is handling his job as president? 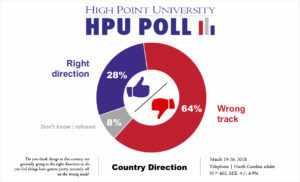 The most recent HPU Poll was fielded by live interviewers at the High Point University Survey Research Center calling on March 19-26, 2018. The responses from a sample of all North Carolina counties came from 402 adults with landline or cellular telephones. The registered voter subsample relied on responses from the participants about their own registration status and yielded a total of 336 respondents. The Survey Research Center contracted with Survey Sampling International to acquire this sample. The survey has an estimated margin of sampling error of approximately 4.9 percentage points for all adult respondents and an approximate margin of sampling error of 5.3 percent for the self-described registered voters. The data is weighted toward population estimates for cellular and landline telephone use, age, gender, race, and education level based on U.S. Census and CDC numbers for North Carolina. In addition to sampling error, factors such as question wording and other methodological choices in conducting survey research can introduce additional error into the findings of opinion polls. 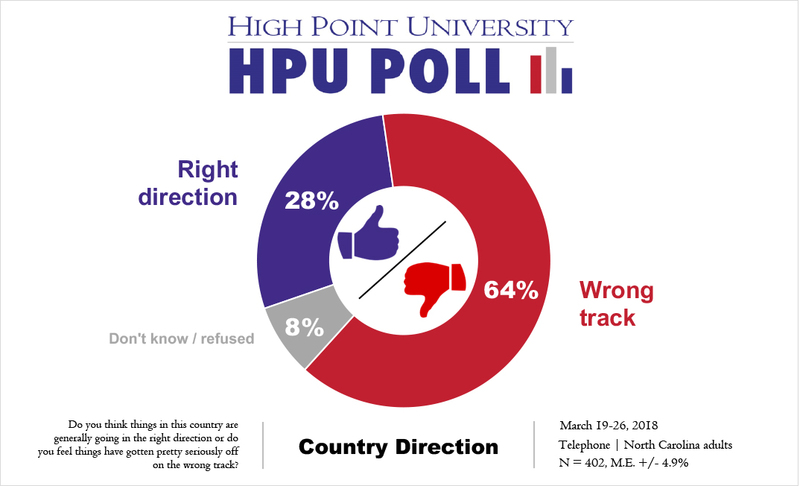 Details from this survey are available at http://www.highpoint.edu/src/files/2018/03/58memoA.pdf. 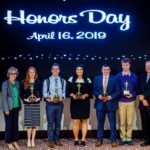 Dr. Martin Kifer, chair and associate professor of political science, serves as the director of the HPU Poll, and Brian McDonald serves as the associate director of the HPU Poll.